UU A Way Of Life: Racism is a live and well in Feguson, MO in direct opposition to our UU principles/values. Racism is a live and well in Feguson, MO in direct opposition to our UU principles/values. 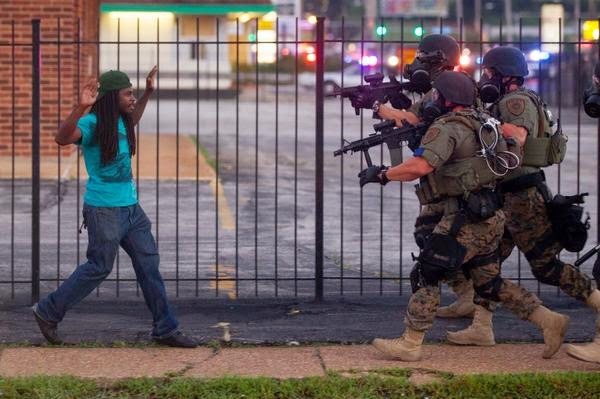 Police in riot gear confront a black man in Ferguson, Missouri. Photo is from a New York Times Article published on 08/12/14. To view it click here. I am interested and curious in the response of the UU churches in the St. Louis area to this incident and the problems in Ferguson. How well integrated, if at all, are the UU churches in this part of the country? I wonder how well our UU principles of the inherent worth and dignity of every person; justice, equity and compassion in human relations; and acceptance of another and encouragement to spiritual growth are being applied and enacted in this area of the country? Along with the Travon Martin case in Atlanta, GA, there are symptoms of pernicious racism which still exist in pockets of our society and it is interesting that it is institutionalized in the form of police power in our communities. Will the UUs of St. Louis stand in solidarity with the african american community of the greater St. Louis area? Will UUs around the country? How many African americans do you have in your UU church?